It is true what they say: moving or relocating is a huge decision that one should not make lightly. There are, after all, a lot of factors that must be taken into consideration when trying to decide whether to move or not, as well as the “where”. So you have probably looked into the logistics, the convenience, and other circumstances that would make your move beneficial. You have probably even looked into the cost involved in actually making the move, until you have settled down. But have you considered the cost that comes AFTER the move? We are talking about the cost of living in your new city or town. For this, you may want to look into using a relocation calculator. A relocation calculator, also called by some as a cost of living calculator, is a handy tool to have if you want to make a comparison of the cost of living between the current place you are living in, and your prospect of a new place to move into. Why is it important to use a relocation calculator? • It offers ease and convenience. There is no need for you to fill up an entire form with various bits of information. Most relocation calculators ask only for your current base salary, your current city, and the city you are moving into. By clicking on calculate or compute, it will then tell you whether you can maintain your current standard of living in your potential new city. In the same way, you will also know if you will need a higher income to support the lifestyle you are used to once you make the move. • It is fairly accurate and reliable. Relocation calculators provide information that is reliable, since they incorporate updated numbers and parameters in making their calculations. These include cost of living elements such as food, utilities, housing, health expenses, and transportation costs, among others. Granted, they might not be 100% accurate, but as a guide or a point of reference, they work very well. 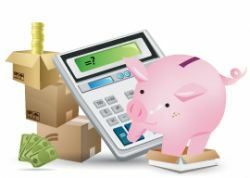 Most importantly, a relocation calculator is a great help when it comes to preparing a moving budget, which is one of the more vital prerequisites for relocation. This simplification of the planning process is most definitely welcome for anyone thinking of relocating.